Overwater bungalows at the Pearl Resorts on Moorea and Bora Bora and Le Taha’a, Private Island Resort & Spa—expect to be pampered beyond your expectations at the ultimate 3 island combo! 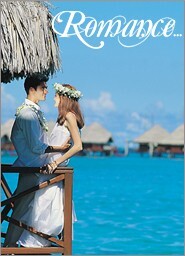 One of our finest Tahiti Honeymoon Packages! 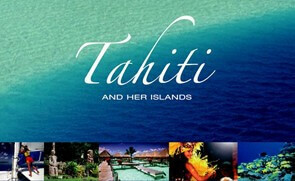 Leave this afternoon for Tahiti–the ultimate honeymoon destination. Arrive this evening where a South Seas greeting of fragrant flower leis and traditional songs welcomes you. 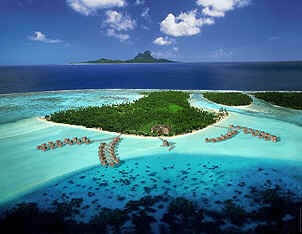 Next… off to Bora Bora. With three days in an overwater bungalow at the Bora Bora Pearl Beach Resort, you’ll have time to relax, snorkel in the crystalline lagoon, and bask in the sun on the privacy of your deck. No stay in Bora Bora is complete without experiencing the exhilarating shark and ray snorkel excursion, and dinner one night at legendary Bloody Mary’s Restaurant. The best should always be saved for last, and for you it is three days in an overwater bungalow suite at the Le Taha’a Private Island and Spa. 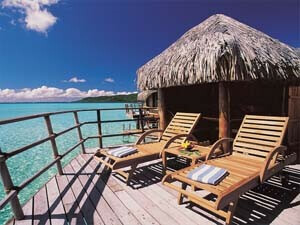 Your bungalow’s large deck allows for maximum privacy and easy access to the beautiful lagoon. Stroll the white sand beaches… explore the “Vanilla Island”..snorkel the coral gardens..you’ll truly feel that you are alone in your own private paradise. Your farewell honeymoon dinner will be served under the stars on the deck of your bungalow. It doesn’t get better than this! Say farewell to this magical island and board the motor launch back to Raiatea for your flight to Tahiti. Depart Tahiti tonight for the United States. The Ultimate Experience Helicopter transfer Bora Bora to Taha’a, from $290 per personUpgrade to Air Tahiti Nui Business Class, from $2950 per person.